The first time that you run Talend, you will need to create a Project. Your projects can be found in the Talend workspace; which, by default, is a directory located in the Talend application directory, for example, /Applications/TOS_DI-r101800-V5.3.0/workspace. As well as allowing you to have multiple projects, Talend also allows you to use multiple workspaces or simply to change the location of the default workspace (see Changing Workspace). As can be seen from the screenshot below, you can either import the demonstration project TALENDDEMOSJAVA or create a new project of your own. If you are new to Talend, you may find it useful to import the demonstration project. If you would like to change the location of your workspace, then hit the Advanced... button. I find it helpful to locate this directory away from the Talend installation directory (see Changing Workspace). Advanced settings also allow you to open or delete an existing project and to import and project other than the demonstration project. If you are using the Talend Enterprise version, you will have the option to create both a Local or a Remote Repository. A repository is almost synonymous with a workpace. If you are using a remote repository, your Talend source code will be stored in an Apache Subversion (SVN) repository (you will also associate this with a local workspace). This allows you to use the Team features of Talend. Remote repositories are outside the scope of this documentation. As previously discussed, my recomendation would be to relocate your workspace to a directory outside of the Talend application directory, for example, /Users/talend_user/talend.5.2.2/workspace. You will find it helpful to indicate the Talend version, especially if you use multiple versions of Talend or when you upgrade to a new version of Talend. 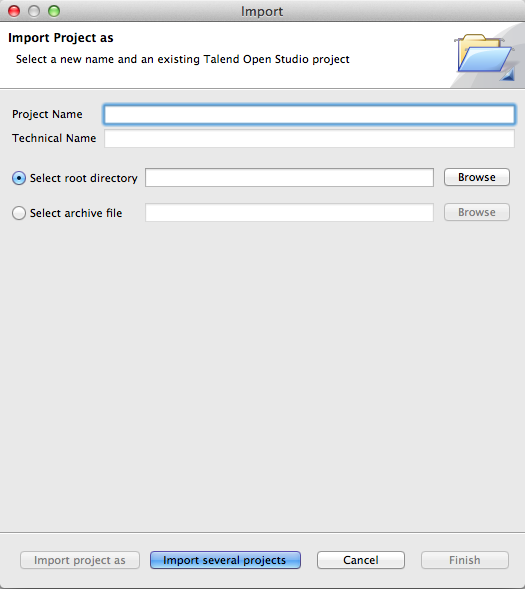 To create a new workspace in Talend Open Studio 5.3, hit the Change Button to load a directory browser dialog. You can only change to an existing workspace or use the features of the directory browser dialog, to create the new directory. Once a new workspace has been created, you must restart Talend. Hit the Restart button to restart Talend. It has been suggested that the Talend Uninstall script will, for some versions of Talend, remove workspace directories (if they are under the installation directory) without warning. Regardless of where you locate your workspace, you will want to ensure that it is adequately backed-up. To create a new project, hit the Create... button. This will display the New project dialog where you can enter a Project Name (which must be unique within the workspace and a Description of your project. 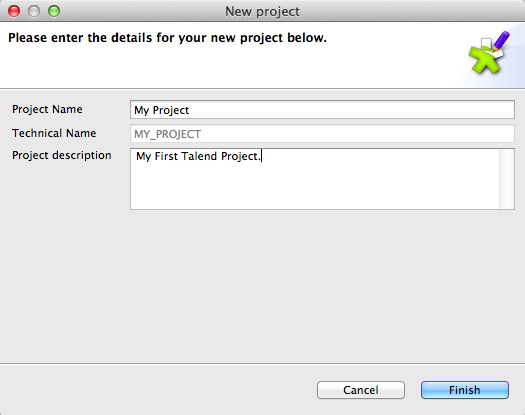 Talend will automatically create a Technical Name based on the project name that you have entered. You can import a project from either workspace or from an archive file. Hit the Import... button to display the Import Dialog, as shown below. This dialog provides you with two ways of importing, Import project as and Import multiple projects. To use this option, you must provide your project with a name. You will be importing the content of an existing project in to this new project. The name of this new project may be the same as the project that you are importing; but it does not have to be the same. If the project name already exists within the current workspace, you must choose a different name. This option allows you to select the root directory of a project is the project directory (identified by its Technical Name) within a workspace, for example, /Applications/TOS_DI-r101800-V5.3.0/workspace/MY_PROJECT. This option allows you to select a previously exported archive file. Archive files are created from within the Talend Designer by either exporting Items or exporting Jobs. For more information on exporting Jobs, read our article on Talend Job Deployment.